Just caught up with the passing away of Reg Arnold last month. Who's he? He's the greatest Australian cyclist you've probably never heard of. 103 six day races, 16 victories, twice European champion and a double world champion... Yet often referred to as Roger Arnold even in his day. Went to Europe early in his career and made his name there. His breakthrough came in the New York 6 days in 1949 with Alf Strom.. They got very lucky in that organisational delays (publicity related) resulted in them cancelling bookings for the flight to New York which later crashed- the Lockheed constellation where all on board were killed. He did come back to Australia in 1954 after he got injured and won the inaugural Tour of Tasmania, which was a fairly local field. He was also caught five metres from the line at that year's Warnambool after starting with a 10min handicap when he wished to be scratch. In 1955, the Paris 6 day was a three man event and Australia sent in a pretty decent side - Reg Arnold, Sid Patterson and Russell Mockridge- three of the best individual talents to emerge from there. Of course, Mockridge had no 6 day experience and only peaked 3 years later (not long before his unfortunate death). *As I forgot to mention, they won the event by 2 laps. He raced with and against van Looy and van Steenbergen. He returned to Australia once and for all in 1963 amid no fanfare and lost both his brothers, who introduced him to cycling, within a year. His memory was sharp right till the end as evidenced by his interview to the cycling Victoria podcast, and maintained that the reason for most of his competitors not living full lives was in part due to drugs. He was also not a fan of handicap racing. "That's for the apes, handicap racing." A view also shared by opperman. He received the OAM in 2012 and his nephew has written a book about him Reg Arnold- sixday man. Jacky Durand's father Henri (aged 80) had been reported missing since 25 November when he was having a cycling ride. His body might've been found drowned in a pond between Ballots and Saint-Michel-la-Roë in the Mayenne. I can remember cheering Javier Otxoa up Hautacam in front of the TV 18 years ago like it was yesterday. The brave little Basque climber in that gorgeous Kelme kit against an all-conquering Lance Armstrong who ate into the gap with every pedal stroke, hell-bent on taking a stage win that would be a footnote for himself, but the breakthrough for Otxoa. In my memory, Otxoa still had almost 1:30 minutes at the flamme rouge, and he lost half that on the final kilometre. But he persevered. Less than a year later, his twin brother Ricardo was dead, and Javier was in a coma with brain injury, possibly irreversible, hit by a car on a training ride. Javier woke up again after two months, re-learned how to use his body, and eventually returned to cycling, winning Paralympic gold and silver medals. Now Javier has followed Ricardo to the other side. May you rest in peace, Javier, and thank you. Thank you for that July day in the year 2000 when you made a 13-year-old boy fall in love with cycling. I can't think of a more worthy wearer of the ancient olive wreath. Andrea Manfredi (with Bardiani-CSF in 2014 and 2015) is among the victims of the Lion Air crash in Indonesia. It is understood that Cantwell died late in the evening of 6 November 2018 after spending much of the day with family and friends. There are no suspicious circumstances. A testicular cancer scare came shortly after the unceremonious end of his racing days and, in typical Cantwell style, he battled on and insisted he would beat the illness. Surgery on a tumour and subsequent treatment saw him overcome it a few years ago and he seemed set to get on with The Next Phase of his life. Sounds likely that the cancer returned, this time fatally. That sounds as if he committed suicide. Bernard Gauthier, known in the 1950's as Mister Bordeaux-Paris, four time winner of the Derby. 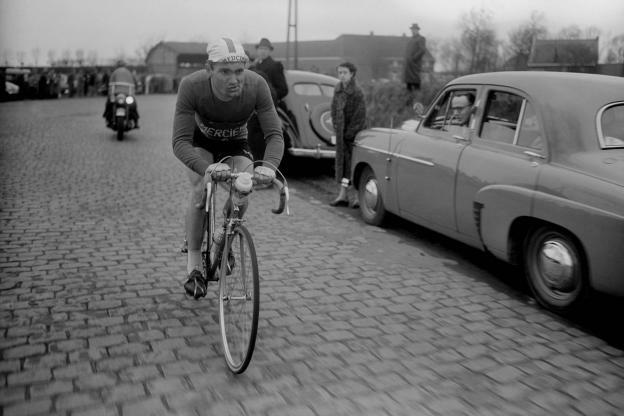 The only French rider to twice podium the Tour of Flanders which he also finished 4th in the very famous 1955 edition when he was in the 4-man break with no other than Louison Bobet, Hugo Koblet and Rik Van Steenbergen, as teammate to the former one at Mercier, who won the race. Bernard Gauthier was a florist after his career, in Grenoble where he passed away at age 94. In 2005 he still rode the "Échappée belle" cyclotourist ride in honour of Raymond Poulidor in the Limousin at age 80/81. He was actually the one to convince Antonin Magne to recruit Poulidor at Mercier. Gaston Plaud was the charismatic Peugeot team director between 1958 and 1974 with Tom Simpson among others. He was aged 98. You could see him in the Belga Sport show about Tom Simpson. Edit: and Lukasz Kwiatkowski, former track rider and Michal's brother, died of leukemia at age 36. Kelly Catlin, a member of the U.S. women’s pursuit team that earned silver a the 2016 Olympics in Rio de Janeiro, has died at age 23. Catlin’s father, Mark Catlin, broke the news in a letter sent to VeloNews Sunday morning. Mark Catlin said that Kelly had died Friday night at her residence in California. Mark Catlin said that Kelly died by suicide. She had written a journal for Velonews that, in retrospect, takes on a much deeper significance. The truth is that most of the time, I don’t make everything work. It’s like juggling with knives, but I really am dropping a lot of them. It’s just that most of them hit the floor and not me. The greatest strength you will ever develop is the ability to recognize your own weaknesses, and to learn to ask for help when you need it. This is a lesson I have only just begun learning, slowly and painfully, these first few months as a graduate student. I still fail. As athletes, we are all socially programmed to be stoic with our pain, to bear our burdens and not complain, even when such stoicism reaches the point of stupidity and those burdens begin to damage us. These are hard habits to break. Belgian U23 rider Stef Loos was hit by a delivery van during a race in Dottignies and died of his injuries. He was 19 years old.